For one man, Halliday demonstrated an enormous breadth of experience and competence, designing a diverse range of recreational and commercial vessels powered by marine motor engine and other less conventional means. 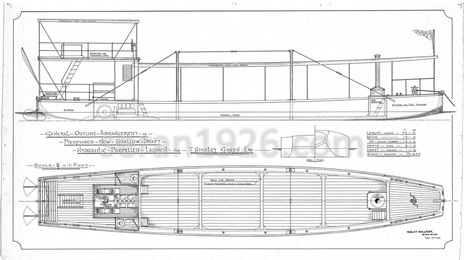 The majority of Halliday’s launch designs were fitted with petrol and / or paraffin motors and were typically fast motor launches or more functional harbour launches of between 20 ft. and 30 ft. Of particular note, is his design for a 40 ft. motor launch for H. H. The Sultan of Perak (1924), intended for State service. The launch was completed in 1926 by Taylor and Bates, Chertsey and reviewed in The Motor Boat, 30 April 1926. Other launch designs of this period used a variety of different means of propulsion. Several outline designs for steam patrol launches survive, the last dating from 1923. Other intriguing designs include an air-propelled hydroplane (1925), hydraulic propelled launch (1923) and tug (1925) and electric launch (1924). A number of designs for passenger launches have also survived: a 50 ft. passenger launch designed to carry 100 passengers, plying from Eastbourne (1923) and a 40 ft. launch designed to the Board of Trade requirements for a steam “6” certificate (1925). Both were built by Maynard’s yard. As the 1920’s progressed, Halliday increasingly focussed on consultancy projects including modifications to existing vessels, sail plans and re-engining cruisers and auxiliary yachts. Examples of his work at this time include: a design for a balance lugsail for a 26 ft. sailing punt (1925); sail and rigging plans for a 14 ft. sailing dinghy (1926), a design for electric submerged log (1926); design for anchor davit for a 35 ft. motor cruiser (1927); modifications to the design of a range of craft including the 80 ft. motor yacht ‘Lady Betty’ (1926), owned by Count Johnston-Noad, member of the British Motor Boat Club. This, together with his work at the Little Ship Club increasingly became his focus. 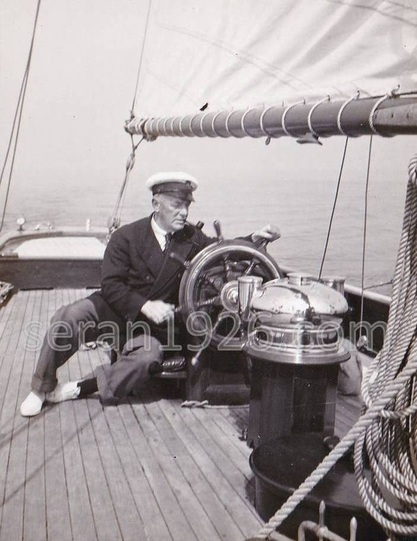 Whilst the 1920’s may have been Halliday’s most productive period in terms of vessel design, in the 1930’s there was a greater focus on consultancy work, in particular on auxiliary and sailing craft. Whilst Halliday spent much of his professional life working as a marine engineer and designer of principally powered craft, he was a keen sailor and between 1906 and 1910 owned ‘Minx’, a wooden centre board sloop of 3 tons, built 1900 by Bathurst, Tewkesbury and ‘Nanette’ a 1 ton sloop built by Dixon Bros, Southampton in 1906. In the 1950’s he co-owned ‘Sally’ a 16 ft. sailing dinghy designed by F. C. Morgan Giles and built in 1933, with J. H. Corah, who he had worked professionally with for many years. His yachting exploits are not fully known but he is believed to have crewed aboard King George V’s yacht, 'Britannia' and was the Honorary Seamanship Instructor of the Little Ship Club from 1928. 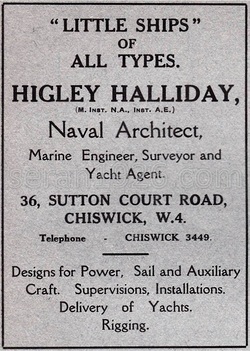 By the mid 1930’s Halliday was advertising his services in the yachting press as a “Nautical Adviser, Surveyor, Naval Architect, Supervisor & Yacht Agent” alongside Laurent Giles, Fred Shepherd, James Silver, Donald Hotchkiss, G. L. Watson and W. G. McBryde amongst others and was listed in the Yachtsman’s Annual and Who’s Who (1938). Examples of his work during this period include the re-rigging of Rendle F. Holmes’s yacht ‘Amazon’, working alongside Cubitt’s Yacht Basin Ltd., Chiswick and Kaygee Contracts when 'Amazon' was re-powered and refurbished in 1938. Halliday designed numerous sail plans: ‘Sunfinder II’ (1930), the motor yacht owned by W. M. Jameson (Halliday is mentioned in book “Sunfinders: A Floating Home”, 1937); a sail & rigging plan and the installation of a new engine in the auxiliary motor yacht ‘Bill Adams’ (1930) and an unusual square sail plan for J. H. Corah’s auxiliary yacht ‘Pelagia’ (1937) amongst others. 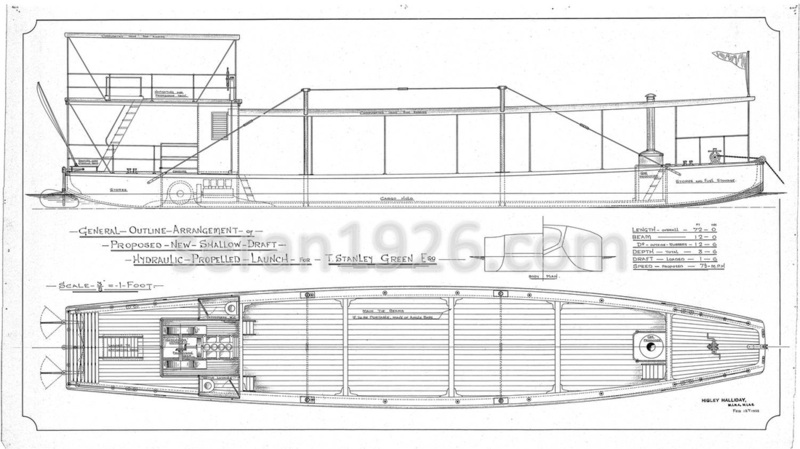 He continued his work designing modifications to powered craft during the 1930’s also, including ‘Seran’ (1934), the 62 ft. Thornycroft motor yacht ‘Poisson Sorcier’ (1934) – replacing the existing transom sterns with fashionable canoe sterns - and the re-engining of J. H. Corah’s 58 ton, 1914 motor yacht ‘Ladybelle’ (1935). In addition, Halliday continued to design a small number of auxiliary yachts and motor yachts, including an outline design for C. H. Lightoller (1930), second officer on board RMS Titanic, who subsequently went on to acquire and convert the Dunkirk Little Ship, ‘Sundowner’. During the war years Halliday was heavily involved in providing training to London based members of the Royal Naval Volunteer Supplementary Reserve at the Little Ship Club. He continued to undertake ad hoc design and consultancy work in the late 1940's principally for L.S.C. members before retiring from an active role in the club in 1950. He remained an active member of the Thames Shiplover's Society and The World Ship Society, both of which met in the basement coffee room of the Baltic Exchange, St. Mary Axe. As late as 1951, aged 76, Halliday was appointed an Assessor in the Formal Investigation into the loss of the sailing vessel ‘Wangle III’ owned by the Mortlake (Surrey) Group of Sea Scouts. Higley Halliday died on 27 December 1962 at the Royal Masonic Hospital, Ravenscourt Park aged 87.